Throwback: The Bespoke Museum of Mrs. John L Strong — Geoff Howell Studio Inc. 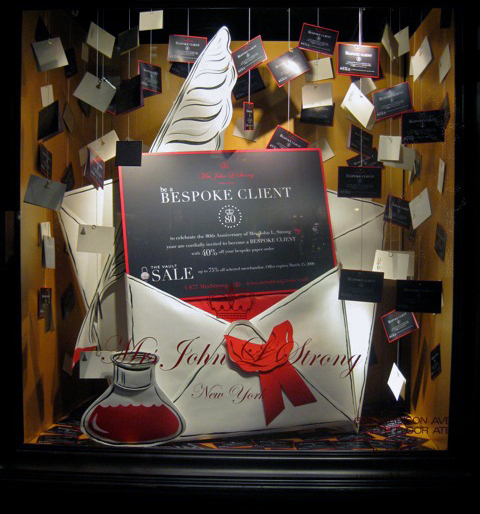 Here's a look back at a couple of window displays we did for the Luxury stationer Mrs. John L Strong on Madison Ave. The first is all about elevating the beautifully crafted signature daily planner to the art form that it is. Pedestal-ed and pin-spotted, the product is presented in a gallery style setting with the mannequin as the thoughtful viewer in a chic paper sheath and sculpted paper hair. The next window was to help promote the Bespoke Client services Mrs. John L Strong offers.This window features a giant invitation to visit the shop, enclosed in a large paper envelope, flanked by a giant inkwell and plume, also constructed entirely out of paper. To amplify the invitation aspect of the window, a flurry of invites and a variety of handmade papers cascade downward. Newer:Typewriter ChicOlder:An American in Paris.